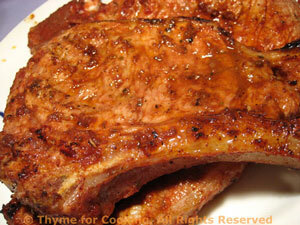 Thyme for Cooking's Main Courses: Grilled Veal Chops, Barbecued Chicken. Refrigerate for at least 1 and up to 8 hours. 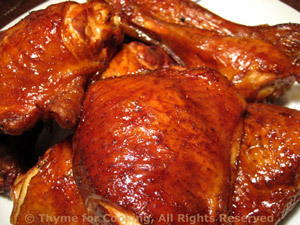 Remove chops from marinade and cook on barbecue grill for 4 - 6 minutes a side depending on thickness or until done to desired degree. Could also be sautéed or broiled for about same amount of time. Serve. Open, drain and rinse beans. Open and drain tuna. Prepare lettuce and divide onto two plates. Arrange tuna and white beans on top of each plate of lettuce. 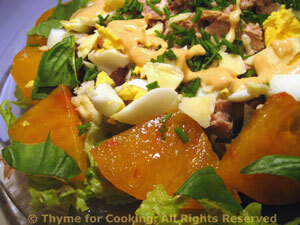 Slice and quarter tomatoes, arrange around salads. Crumble cheese and sprinkle on top along with herbs. When eggs are done, peel, chop and add to salads. Drizzle with a bit of dressing and serve, remaining dressing on the side. This is based on a Williams-Sonoma recipe. You'll get plenty of garlic flavor in the simmered stock - so adding the whole cloves to the pasta is optional; just discard after simmering if you choose. The long, slow cooking does make them rather sweet, though, so you may want to try one! 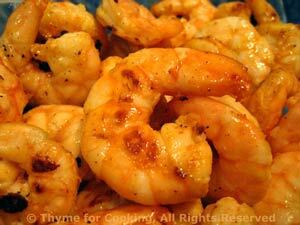 When done, drain, and toss with 1 tbs of the good olive oil. Peel garlic but leave whole. Add turkey and garlic and sauté 6 - 7 minutes, turning turkey once. Remove turkey, leaving garlic in the skillet. Garlic should be very lightly browned. Add chicken stock to skillet, reduce heat to medium-low and simmer, uncovered, until garlic is very tender and there is 2 - 3 tbs of stock left in skillet, about 15 minutes. Snip herbs and add to pasta. 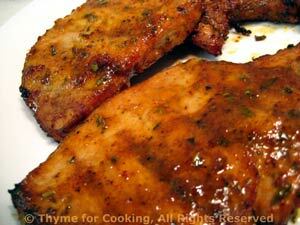 Slice turkey into strips and add to pasta. 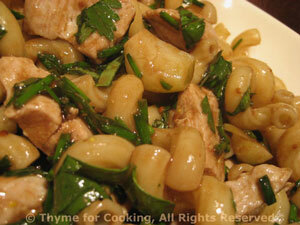 When the garlic is done, remove from stock and add it to the pasta if you choose. Pour remaining stock into a small bowl. Add vinegar, mustard and remaining 1 tbs olive oil and whisk well to combine. Pour over pasta, stir to combine and serve.